Perhaps the most mind-bending thing about the universe is how you can see back in time, merely by staring far enough into the night sky, as the light from the stars take eons to reach us. Peering in far enough, you can see the remnants of the days when our universe began. Investigating the first billion years of the universe, scientists have now uncovered one of the first galaxies, which came into being some 700 million years after the Big Bang event. As exciting as this sounds, researchers are left with a new puzzle – why, despite its advanced age and small size, is it filled with cosmic dust? The problem, according to the paper published in Monday’s issue of Nature, is why this dust is here at all. Daniel Marrone, who is an expert on galaxy formation at the University of Arizona did not participate in the study but was immensely surprised to read of the discovery. While we may be made of star stuff – our body composed of the same elements forged in the galaxy’s beginning, the universe following the Big Bang was all helium and hydrogen gas – as well as the elusive dark matter, hardly anything that would leave behind dusty remnants, the leftovers of ancient stars that burst. The gasses floated through the universe for the millions of years after the Big Bang inflation event, condensing into the first stars. That buildup of heat forged the heavier elements – among them carbon, silicon, and oxygen, before they died, unleashing those elements far into space. The first dust formed from those elements, and later congealed to become planets and asteroids. The first of our stars had likely lived full cycles before this recently discovered galaxy, which astronomers are calling A1689-zD1, was born, indicating a universe that still had considerable dust. Most of it, however, would likely have come from large, bright galaxies that formed lots of stars. By contrast, A1689-zD1 is considerably small and dim, not larger than the Large Magellanic Cloud, a dwarf galaxy orbiting our Milky Way. Not many of these early galaxies have been discovered, due to their far distance and their dimness – leaving many cosmologists to speculate on the nature of what others may look like. They are currently tracked down by traces of the gravitational waves they give off, an aspect of Einstein’s general theory of relativity which states that gravity coming from objects closer will warp light rays coming off of distant objects. Ironically, Einstein suspected that we’d never have the technology needed to observe this process which astronomers refer to as gravitational lensing. 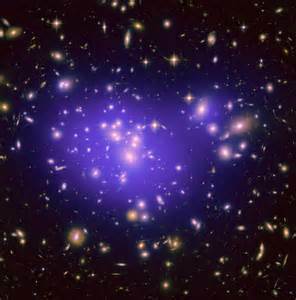 Darach Watson, the paper’s lead author, used the Very Large Telescope (VLT) of Chile’s Atacama Desert to study the massive cluster of galaxies known as Abell 1689. The gravity of Abell 1689 magnified galaxy A1689-zD1 by a factor of nine, says Watson, allowing him, along with several colleagues to measure its proximity to Earth and then determine from how long ago the light from its star systems began to move towards Earth. The only way to test their idea further would be sure to discover small galaxies such as the A1689-zD1 in the nearby area. Unfortunately, due to their low levels of light, this is a rather difficult task. They would then have to determine whether galaxies of this size with high levels of dust are more common than others. “We don’t have any other candidates at this point,” says Watson. However, as another generation of telescopes that read wavelength frequencies come to light, things may soon change.